Summer Breeze Vacation Rental in Port Aransas, Texas from Starkey Properties : Comnfortable Vacation Rental for a couple or a family of four! Tigger Travels - Family Adventure Journal Photos From Tigger`s Travels and MORE! 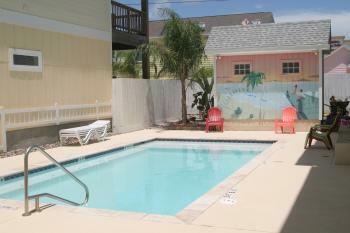 Comnfortable Vacation Rental for a couple or a family of four! According to the chamber of commerce there are 36 Condominium buildings, 11 cottages, 30 hotel/motels, 20 property management companies that rent between 100-300 individual homes/condos each and 10 RV parks. So there is a wide variety that fits every need. 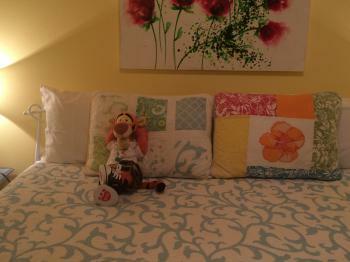 Since is it just Tigger and his 2 helpers we choose a fantastic little cottage over the Pelican�s Roost area. This unit named �Summer Breeze�, yes almost all the Island rental homes have cute beachy names to fit the personality of the house. Our cottage is rented managed and rented out by Starkey Property Management. When we arrived the key and unit were ready for us, the staff was friendly and welcoming and made check in easy and seamless. Wed had already downloaded their app on our phones and new exactly where we going so all that was left see our unit. Let�s start with �Summer Breeze aka 103PPT�, One of the most unique features of this cottage is it is on the ground floor, no stairs are required. This makes a perfect choice for guests with mobility problems or couple with young children. �No hauling strollers and pack and plays up and down the stairs�. Summer Breeze is a 600 sq. foot unit that can accommodate 4 people. There is a king size bed for the adults and plenty of room if you want to bring and air mattress for the kids. 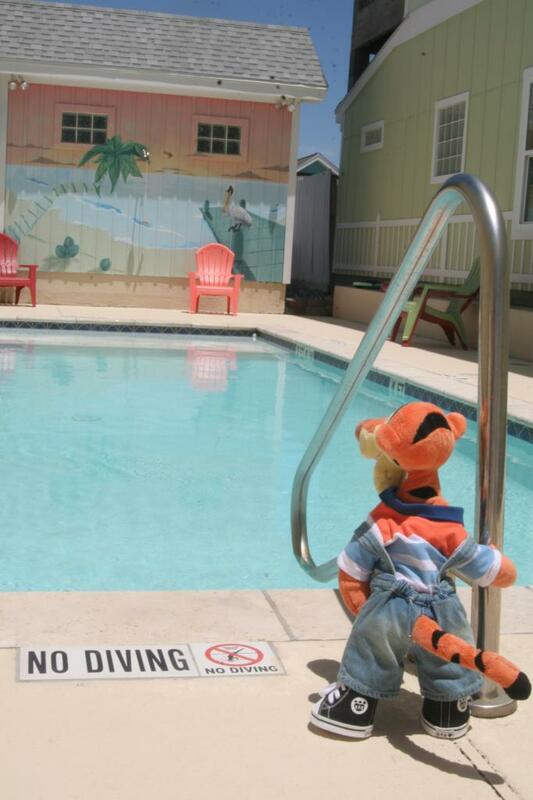 Tigger wanted to stay in this unit for several reason one of the main is it is pet friendly to dogs so he knows the owners must love Tiggers also. This room is on the ground floor of a larger house. 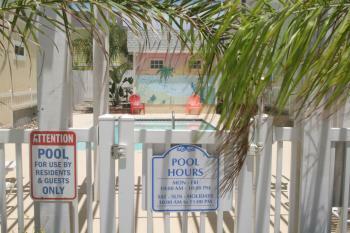 It has its own entrance that is located in the back of the property near the fenced yard. It is quiet and makes you feel very secluded. My first impressions when I walked in the door were wow this place is big and what beautiful wooden support posts and stained concrete floors. 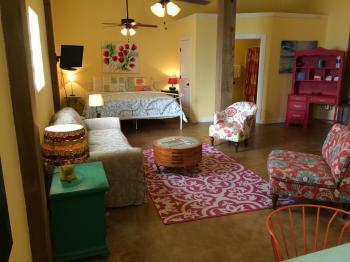 The walls are painted sunrise yellow that gives a very beachy feel to the room. The ceilings are approx. 14 feet high with 2 drop down ceiling fans to circulate the air. The windows are covered with classic Caribbean shutters that allowed us to regulate the light and air conditioner kept us cool and comfortable in August south Texas heat. The d�cor is bright and colorful with large canvas art work full of bright colors, florals and beach scenes. 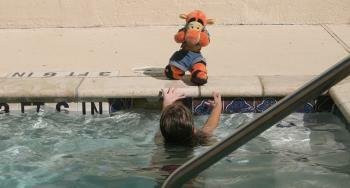 Tigger�s favorite was a couple wading knee deep in water. 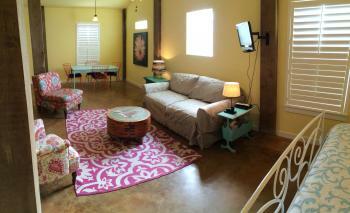 The living room has comfortable seating with a couch and 2 chairs. The only drawback was the arrangement of the furniture. The placement of couch made it very hard to see the TV so we mostly used the chairs. Considering we have recliners at home this was not an issue. The TV is small and is overwhelmed by the room, however the owners provide a premium Direct TV package with all the movie channels which was fantastic for relaxing in the evenings after a long day at the beach. 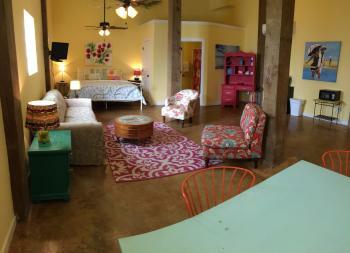 Summer breeze has a king size bed that is very comfortable. The bathroom is small but very functional with a standard toilet, sink and shower only. When we travel with the entire family we look for rental homes with full kitchens but on this trip it would have been have been overkill so the small fridge for drinks and sandwiches along with the microwave and Keurig coffee maker suited us perfectly. We used the hutch to store snack food and as a prep area. If you go to rent this unit remember it is self-catering, utensils, plates, cups, shampoo, soap etc. are not provided. Luckily there is the IGA on the Island, you are already there buying sunscreen so you can easily pick up some essentials. THE POOL! I can only describe as fantastic. One pool is shared by 4 houses. The placement of it allows for it to be sunny from around 12-4 (in august) and shady the rest of the time. The shade keeps the water cool and refreshing. There is bench seating around 1 side and a shallow splash platform for small kids or adults. I must admit I spend many afternoons some of them by myself sitting in the water reading a book thinking I have found paradise. We will be back soon. 103PPT - Summer Breeze on the Starkey Properties site.